First, I just want to say thanks for all the great feedback I've gotten in comments and email. I don't make any money from doing these tutorials, I don't want donations and I'm not a fan of ads so your comments are what keep me going. Silly I know, but just a little "Thanks!" really does make all the work that goes into the site and these tutorials worth it. So "Thanks!" for the comments and emails. Keep them coming! I love hearing back from people using the tutorials and benefiting from them. I have been working on completely re-doing the Wizard tutorial and the re-write is now down and posted. I have broken this tutorial into four parts to make it a bit more digestible and easier to follow. This is Part 1 and it covers getting basic input from the player via the keyboard and then using that input to move a sprite around on the screen. 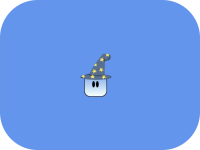 You can head on over and check out, The Wizard: Part 1- Moving a Sprite around the Screen. As always, the source code is provided along with the tutorial and feedback is strongly encouraged and welcome. Enjoy! Great didatic, great tutorial.Just simple and useful. Thanks very much for all your hard work! Wish I could buy you a beer. I really like your tutorials a lot. I have been looking a lot of places for XNA game development for beginners and your site actually caught my time the longest. Thank you for all the tutorials. i am beginner and you have helped me understand how things work. I still need to learn a lot, but this is the best place i have found on the net to get started. Thank you. I've been a programmer for years but just started tinkering around with game developemnt. These tutorials are the perfect starting place. Your sprites collection is very good too. Thanks a lot for this great tutorial! I was just wondering if you could actualy explain the best way to flip the sprite so it follows the orientation. :) That would be even more awesome! Once again, thank you! I just completed this tutorial with my own sprites and I gotta say I'm loving it. Your tutorials are all so clear and well explained. keep up the good work. Thank you. I just finished moving my Wizard. Excelent tutorial for people that is new to XNA. IT is really a great tutorial, easier than the one I found in MS official website. after making sprite class changes I got an error in project that mSpriteTexture is null (for scale property), and that is rightly so as my Game1.cs init function is trying to set Scale property before LoadContent gets called where we set that variable. so I guess you need to initialize mSpriteTexture before that. I had the same problem with the compilation error saying mSpriteTexture is null. To make the code compile correctly I omitted it and just put Scale instead of the multiplication of width and the multiplication of height in the specified regions and finished the coding. I didn't find any errors so now I don't even know the importance of this section of coding. Any explanations are greatly appreciated and I greatly appreciate your tutorials and how you stay true to object orientated mentality. Coding is much simpler and cleaner when following that approach. I also had the same problem. But putting scale there only will not serve it's purpose. I just placed an if condition to check that if the texture has been loaded, then apply the size to the sprite. i am having some trouble going slightly freestyle. Meaning that i am trying to create a project that combine the first bunch of tutorials making a wizard move, jump, duck and shoot fire on a scrolling background. How would i do that??? i learnt a lot from this. suppose i have a character (may be a man's image) instead of the sprite(square image). the character will have legs. i have images which depict the leg movement. so for every update i set the texture2d as the next image to be shown. Thanks for the tutorial, however, I tried copying this onto the Windows Phone 7 SDK and for some reason, my wizard won't move! Has anyone else had any trouble with this? When I push the arrow keys, nothing happens. Does anyone have any suggestions? And you don't have to write it all on the same line. For C#, commands aren't complete until a semi-colon ; is encountered. This allows you to break up your code for readability. If you're new to starting out, I highly recommend though that you take some time to learn C# first without throwing in the complications of XNA and game development on top of that. You don't have to become an expert, but understanding the language and the basic C# syntax will make your progress go much faster and smoothly. oh, ok thanks very much, I am getting a book on C# in about a week to learn a bit more. I actually have the same issue someone above has mentioned about the Draw section. Even being a little familiar with C#, I still am not understanding what the error, "Object reference not set to an instance of an object" means when trying to compile. I tried adding new somewhere in there but it wasn't working. Just wondering if I need to add anything or take something out for it to work and so I can move on to your other tutorials? The issue is with mSpriteTexture but I'm not sure what I need to be doing to fix it. i spent quit a lot of time to study this movement, and i can`t understand how those classes update each other and how they update the Game.cs. How can u call a draw method from the sprite class if in the Game.cs u initialized the wizzard class??? It is not the first time I visit your site. Every time I read your posts and admire how perfectly you write. Every single article is very well structured and organized accordingly to SEO needs that search engines like. I am also trying to follow your example, but it is still very tough for me as I have not got much expertise in it! Thanks for sharing it..
Hi! Thanks so much for sharing your wealth of information. I just started in this and I'm getting to know it better! Many thanks for all of your hard work! I was just wondering if you could actualy explain Once again, thank you! the best way to flip the sprite so it follows the orientation. :) That would be even more awesome! This is Part 1 and it covers getting basic input from the player via the keyboard and then using that input to move a sprite around on the screen. Great tutorial, but I think when you say "overrides are the same method but with different or extra parameters," you mean overload. Override is when a subclass overrides a superclass's method. Thank you for all the tutorials. i am beginner and you have helped me understand how things work. they are able to feel free to buy needed things. Moreover, a lot of banks present auto loan for different persons. gives an exception ContentLoadException: Error loading "WizardSquare". File not found. Very interesting and useful discussion for me. I think this is a common problem for all parents so don't worry about it. Thanks guys for such a great comments, have a good luck.